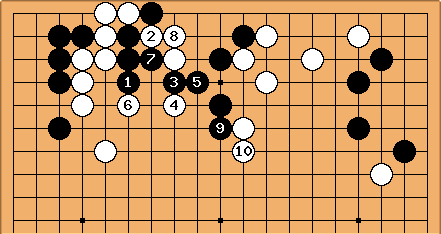 If the marked stone in Thickness Example 1 is not in place, Black might block the 3-3 point invasion from the other side, in order to create thickness. Again, Black builds a wall. The marked stone is now closer to the wall, but because a white stone is already in the area, this makes perfect sense. 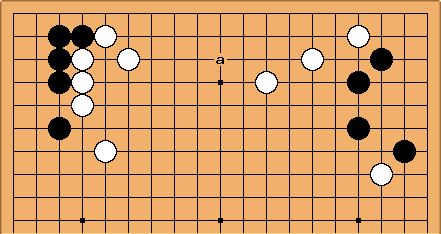 This configuration is again regarded as strong, and influences the center and the lower side. Charles Matthews Certainly an influential position. But thickness? 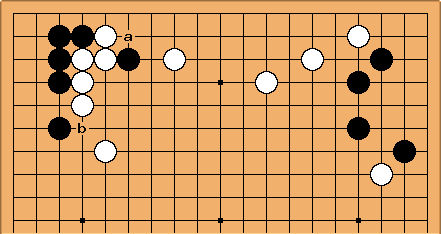 There are weak points in Black's formation. 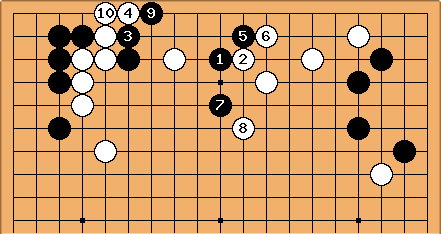 Here Black can aim at a, and also to use the threat of a cut starting with b. 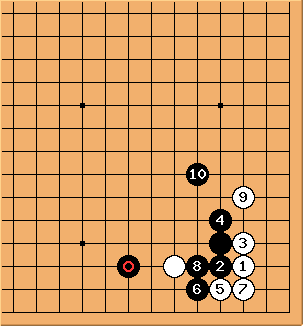 And Black pushed out into the centre, having successfully invaded and isolated White's top left group (cf. framework theory). So, influence. But thickness should mean more than influence+propaganda. After removing one Black and one White stone and rearranging slightly.... White's wall has eye shape, and, I think, is without doubt thick. Still, Black has an effective invasion at a or thereabouts, does he not? I think that White is a bit better in this position, but not by much. I don't think that thickness has to be without weakness. Wall death is unpleasant, but I have been known to lose three walls and win the game. ;-) I considered those walls thick, too. Charles Considering the definition given at thickness, one can't call the wall here thick. Actually the problem is more likely in the definition. I believe that few contemporary joseki give one side a thick position, judged by that standard - pros are reluctant in general to allow the opponent perfect positions. Therefore 100% invulnerable thickness tends to arrive in 'second-phase' fighting - as a result of middle game invasions, typically. My preferred way of looking at this is a scale of influence with the flimsiest of frameworks at one end, extremely solid thick positions at the other. And the criterion I find helpful is to do with direction of play: thick means you are happy to drive the opponent towards the position, while of course it's not in general good to push your opponent's weak group into your own framework. That makes the concept of an overall, whole-board thick position for me into one where I can freely choose the direction of play for attack. That sounds about right, and does something to expand the concept, which is surely not just an aspect of shape. One should for example be thinking about how Otake plays, not just Takemiya.